During the past season, with many people living in the Western Cape trying to survive with a mere 40 to 50 L of water per person per day, many figures were quoted reminding us just how much water is commonly used in our daily living. For example, that about 19 L of water is used for a 90-second shower and that one flush of your toilet will use 9 L.1 Many people were also surprised to realise just how much water they “consume” through eating their daily food. For example that it takes 132 L of water to produce a single cup of coffee (125 ml), 196 L for a large (60 g) egg and 18 L of water for a slice of bread of 30 g. For supper, your 200 g steak will cost you 3 083 L of water and your small (125 ml) glass of wine 109 L.2 But the question is: what do these values really mean and do they matter? These values also referred to as a “water footprint (WF)”, provide a measure of the amount of water used to produce each of the goods and services we use – whether your favourite fruit, a glass of wine or pair of jeans. Because of the nature of goods and services, a WF can be expressed in different ways, for example, a litre of water used per kg of crop produced (L/kg), but also litre of water used per unit of currency derived (L/R). WFs considers both direct and indirect water uses and are sometimes expressed in its colour components: green, blue and grey. Let me explain. For example, the 109 L of water used to produce your 125 ml of wine will take into account all water used right from the production of grapes on the farm (e.g. rainfall and irrigation) all the way to the cellar (e.g. harvest container washing, wine making processes, cooling and cleaning), but even beyond that, all the way up to the recycling of your wine bottle. Indirect water uses considered will include the water used in the production of electricity, fuel, the wine bottle, labels and others. The colour classification refers to the origin or impact of the WF. 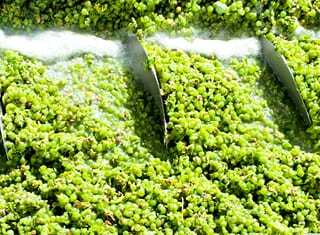 For example, the green water component will represent the rainfall which ends up in the soil and is used to grow the grapes. The blue water again will represent all “physical” water used (for example for irrigating the crops) and which is extracted from streams or groundwater. The grey water component represents something very different to that which we consider grey water at home. The grey water fraction here is the volume of water required to dilute “polluted” water back to an acceptable standard for an area. Grey water is typically the result of on-farm chemical application or waste water generated in a process, such as making wine. One could possibly argue that WF “numbers” do not matter much where water availability is sufficient, sustainable and of good quality. But under water-constrained conditions like the semi-arid regions of South Africa, including the Western Cape, these WF numbers and their meaning should matter. But just how much do we know about the WF of for example the wine or table grapes produced in the Western Cape of South Africa? Likely less than we think. The Water Footprint Network (WFN) is a good source of numbers for a wide range of crops and products for different countries and regions and can be viewed on waterfootprint.org.3 According to the WFN, the average WF of wine grapes produced in South Africa is 603 m3/ton4 of grapes, compared to the global average of 869 m3/ton. Interestingly, the WF of fresh grapes is 422 m3/ton of grapes, compared to the global average of 608 m3/ton.5 Just considering these values, it would suggest that South Africa is fairing quite well compared to the global averages. Unfortunately, since no contextualisation of the values is given, this conclusion cannot be drawn. 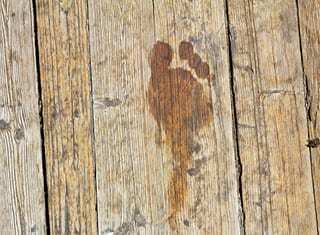 To shed more light on WFs, a new study jointly funded by the Water Research Commission6 and Winetech aims at determining the water footprints for table and wine grape production, as a sustainability indicator. This project aims at generating more than just WF numbers, but placing these into the context of the environmental, societal and economic conditions. The research, under the leadership of Dr Caren Jarmain, will consider the WF of both the wine and table grape industries. Although both the wine and table grape industries revolve around the Vitis vinifera plant, the processes involved in producing table grapes and wine differs significantly. 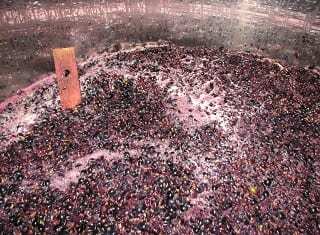 In this study, the WF of wine (in m3 of water per L of wine) will represent the water used in all the processes, right from the vineyard block up to the wine cellar, but before bottling. Similarly, for table grapes, the WF (in m3 of water per kg of grapes) will consider all processes from the vineyard block up to packing the grapes in the packhouse, but before final cooling. This approach should allow the researchers to separate the WF into the part up to the farm gate from that beyond. 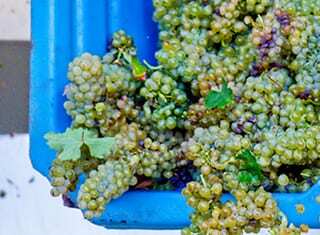 This research is conducted in the Western Cape Province and a number of table grape pack houses and co-operative cellars from the different production regions are already participating. This means that the wide range in production conditions which the Western Cape is known for will be accounted for. To provide anonymity to the participants of this study, the final WFs will be expressed per region and not individual pack house or co-operative cellar. What makes this study unique is the use of satellite-derived vineyard water use data and the integration thereof with available grape and wine production, climatic and other datasets (e.g. cellar water use and soil water content). The fact that block specific production and vineyard water use data are available, means that the WF of wine (of co-operative cellars from a specific region) or table grapes (for pack houses from a region) can be expressed as a range in WF values, rather than a single value. This WF range will allow for interpretation of the variation, which will lead us to understand the drivers (production or other conditions) behind low or high WFs. Finally and at the end of this project (2020), this new knowledge should empower both the wine and table grape industries to make the most of these numbers. Whether by addressing poor (high) WFs through specific changes at farm, cellar or packhouse level and subsequently improving the impact these sectors have on water. Or, by utilising this knowledge in promoting South African products and produce on the basis of its relatively small WFs. Mekonnen, M.M. & Hoekstra, A.Y., 2011. The green, blue and grey water footprint of crops and derived crop products. Hydrology and Earth System Sciences 15(5): 1577 – 1600. Refer to: https://waterfootprint.org/en/resources/waterstat/product-water-footprint-statistics/. 1 m3 is equal to 1 000 L.
These values were generated using generic crop growth models and long-term climatic data for the period 1996 – 2005. Water Research Commission Knowledge Review 2017/18. Refer to: http://www.wrc.org.za. – For more information, questions or feedback on this research, contact Dr Caren Jarmain at cjarmain@gmail.com.